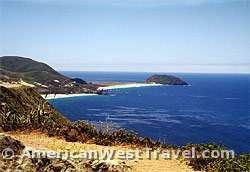 "A Scenic Drive with no Peer"
As you head south on the Pacific Coast Highway (California Highway 1) from Carmel, the coast begins its transformation from the intimate coves and headlands found at Point Lobos State Reserve in Carmel, to the famous cliffs of the Big Sur. 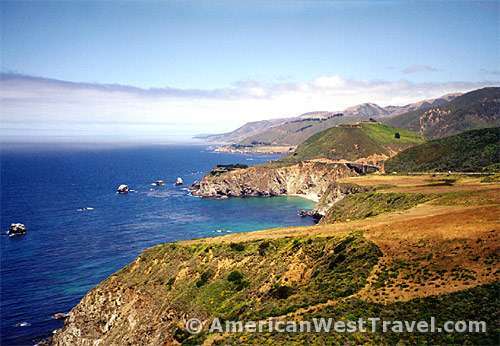 The photo, above, faces north from the Point Sur area to Carmel in the distant haze. The emerging cliffs are apparent. 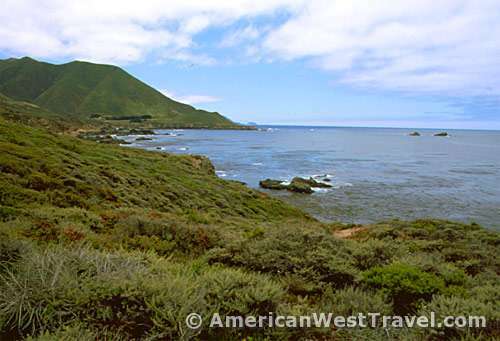 Just south of Point Lobos (right) the rolling meadows and shallow cliffs does not disclose the excitement to come if you're heading south. In fact the distinctive craginess of Point Lobos as shown, below right, pretty much disappears. 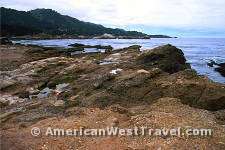 The sweeping beach of Garrapata State Park, littered with giant rocks, is south of Point Lobos. 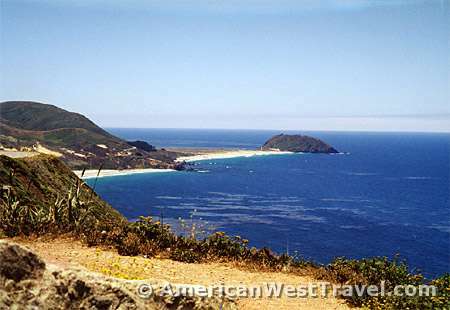 The famous beach scene in the movie, "From Here to Eternity", was filmed in this area, not Hawaii. A few miles further south, the cliffs start growing. 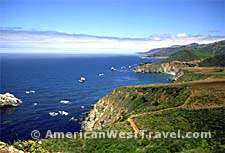 The breathtaking cliffs of Big Sur actually run for about ninety miles, from Point Sur in the north to Ragged Point in the south. Beautiful pocket beaches often composed on black sand are sometimes found at the base of the cliffs. 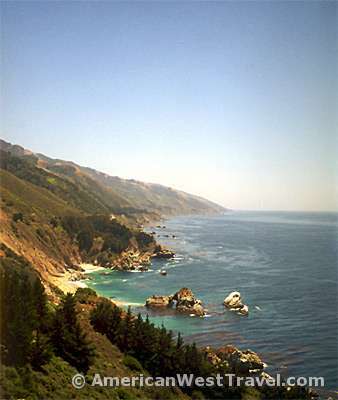 Note in the photo, left, the highway on the side of the cliff hundreds of feet above the water. 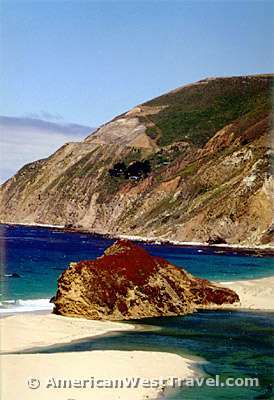 The beauty of the cliffs is enhanced by the colorful mountainsides (right). Wildflowers and blooming plants are common into the summer. The fragrance of herbal plants such as anise sweeten the air. 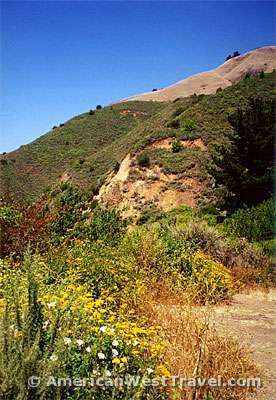 The dried-out brown grasses provide a contrast to the green scrub and occasional wooded areas. 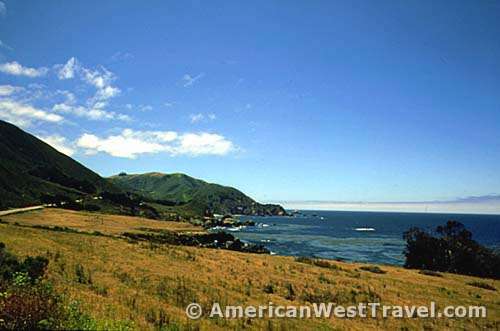 After Point Sur, the Pacific Coast Highway (California Highway 1) veers away from the coast and into the woods for a stretch. The village of Big Sur and Pfeiffer-Big Sur State Park are the next destinations. 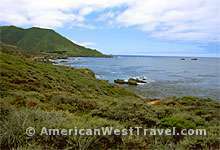 Point Lobos is on the Pacific Coast Highway (California Highway 1), just three miles south of Carmel.